Amber Tyrell enjoys life's simple pleasures. A perfect evening for her includes a good book, a glass of wine and, of course, a great meal, preferably straight from the jugular. Raised to eat ethically, Amber dines only on delicious cold-blooded killers. But confirming that her chosen victims deserve to die takes time. And patience. So it's a good thing Amber is studying to be a librarian. Her extraordinary research skills help her hunt down her prey, seek out other vampires and stay on the trail of her mother, who has been missing for over two years now. 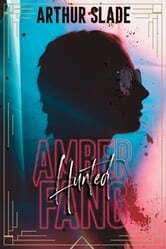 But one day while Amber is stalking a rather tasty-looking murderer, things go horribly wrong. Amber has walked into a trap. The hunter becomes the hunted. Now on the run, Amber receives the perfect job offer out of the blue. Someone wants to pay her to kill (and eat) the world's worst criminals. It sounds too good to be true. Amber Fang: Hunted is the first book in this exciting new vampire series.